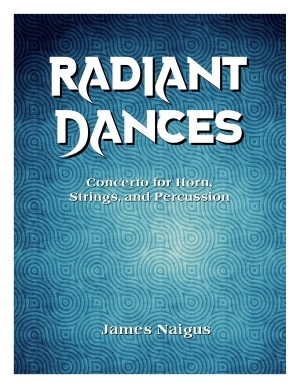 Radiant Dances, concerto for horn, strings, and percussion, was commissioned by and written for Jacquelyn Adams. The piece is divided into sections featuring the diverse characteristics of the horn including grandeur, melancholy, and playfulness. 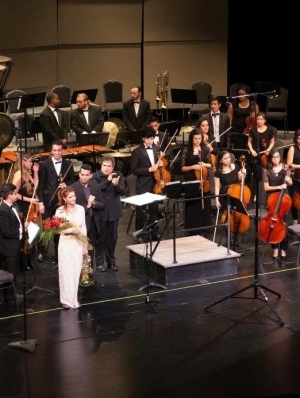 My goal was to write a piece of music that showcases both vibrant energy and elegant musicality within the sonorous timbres of horn and strings. The first movement evokes the calmness and beauty of a pastoral scene, paying tribute to the horn's historical roots as an outdoor and hunting instrument. The second movement is based upon the chaconne, with repeated harmonic progressions underlying the swirling of solo voices. The duet and trio dances, sometimes in harmony and other times offset, are paired down to a solo in the middle cadenza section. The third movement is a jubilant festival of sounds and excitement, giving the horn the chance to be whimsical and to soar. Movement 1: Your browser does not support the audio element. Movement 2: Your browser does not support the audio element. Movement 3: Your browser does not support the audio element. 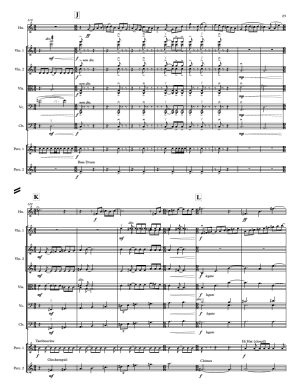 Available direct from composer - persusal score and demo recordings available upon request.